InAccel today released the new version of the Coral FPGA resource manager that allow FPGA users to seamlessly deploy and manage FPGA cluster on the cloud or on-premise. Several cloud operators have recently started deploying FPGAs in the cloud, allowing users to benefit from the acceleration of FPGAs. However, currently there is a lack of frameworks that allows the automatic deployment and resource management of FPGA resources in the cloud. For example, current framework supports the communication of one application with a single FPGA for every node. InAccel developed a novel framework that allows the automatic scheduling and resource management of FPGA resources from several applications. That means that using InAccel's Coaral FPGA manager many applications can have access to the pool of FPGAs in the cluster. The FPGA user do not have to worry any more about the scheduling and the resource managements for the FPGA cluster. The resource manager is deployed and evaluated for widely used machine learning frameworks in a cluster of FPGAs in the cloud. The performance evaluation shows that the proposed framework can reduce significantly the integration of IDE tools with the FPGA cluster with negligible overhead. 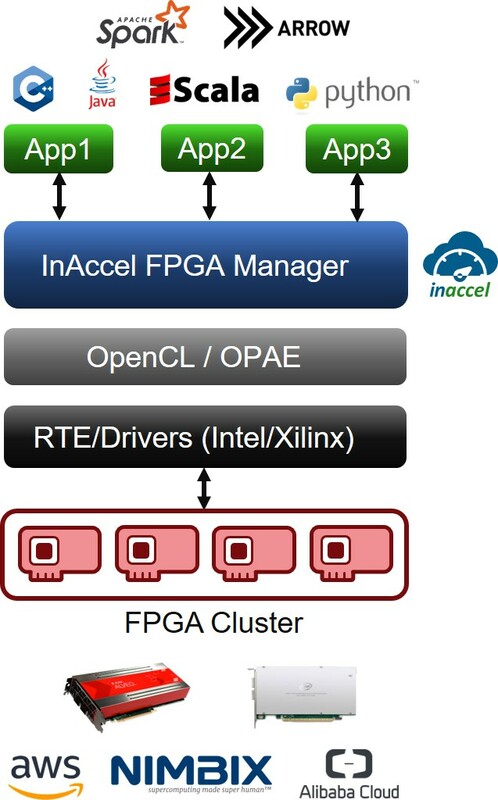 InAccel offers a free version of the FPGA resource manager with limited features (Up to 3 accelerators and up to 2 FPGAs). Users can find more info here and the full documentation for the FPGA integration is here. InAccel offers all the required high-level functions that make it easy to build and accelerate parallel apps. No need to modify your application to use an unfamiliar parallel programming language (like OpenCL). And you can use it interactively from the Scala and Python shells. (Runs on any FPGA platform (Xilinx, Intel), giving you the freedom to take full advantage of on-premises, or public Cloud (AWS, Alibaba, Nimbix, etc.) infrastructure. Launch a container with InAccel's Docker image or even deploy it as a daemonset on a Kubernetes cluster and enjoy acceleration services at the drop of a hat. Coral allows the secure sharing of the hardware resources among different users and multiple processes or threads. First class isolation support for accelerator cores and FPGA memory. Built-in Web UI for viewing cluster state, navigating in memory objects and monitoring acceleration tasks.